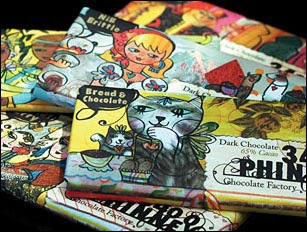 Maya, blogger at American Gourmande reviews three Theo bars. We were impressed by the pic of her enjoying our Classic Spicy Chile bar - look at the size of that piece, she must be a spice lover! She also reviews the Jane Goodall Milk bar and the Fantasy Flavor Hazelnut Crunch. Maya: "It almost tastes like toffee, Aja thought they might have used candied hazelnuts to achieve that flavor. Definite crunch to this! It has a salty aftertaste that is just glorious." Thanks for sharing the link Kate! We will be holding our annual SOCIAL & SALE event next Wednesday evening from 6:30-9:30! Please join us for a fun filled evening with special sale pricing, and great gift ideas! There will be chocolate to sample, sipping chocolate to taste, and Theo brownie's fresh out of the oven! Please come by, say hello & stock up on all your Theo Chocolate necessities for the holidays. We are one of the 101 Things to do in Ballard. Be sure to check out the blog of our partnership with Caffe Vita: A Tale of Two Roasters. Last but not least: this is the last weekend to get yourself a chocolate scorcher at Cupcake Royale, but not to fear their next cupcake of the month features our nibs!! Have an amazing Memorial Day weekend everyone! All of us here at Theo hope that you ALL had a lovely Easter, Passover, or maybe just a lazy spring weekend! The Chocolate Cult wrote a nice little blog post about tasting our enrobed nib brittle. Stay tuned for some super special items we will be offering for Mother's Day, coming up on May 10th! Naomi's Mind is a big fan of our Bread & Chocolate bar, Everyday Just Living wrote a great post: If Willy Wonka Were A Social Activist, He’d Work For Theo, & Nari Nari called us cheap, in the best sense of the word (we hope ;D ). NWSource wants to know what you splurge on in spite of the recession? Theo chocolate is on the list! Everyone here at Theo wishes you a warm, cozy, and safe Thanksgiving! Fancy Food & Culinary Products chose our 3400 Phinney coconut curry bar as their editor's choice. On Sunday, the Seattle Daily photo described the dramatic color of the sky as "theo chocolate colored". Thanks to beautiful child for including Theo Chocolate in their favorite things (holiday season)! According to ZOMG, candy the new Starbucks Chai Truffle doesn't quite measure up to our 3400 Phinney Chai bar. Theo came up in a heated discussion about criollo and forastero, over at 70%. 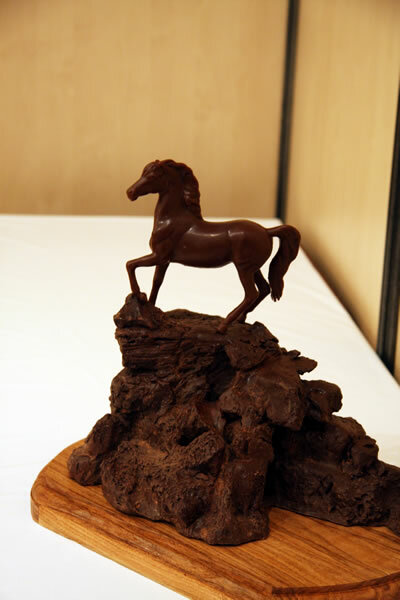 You can read more about The Great Forastero vs Criollo Debate, over at The Chocolate Life. ...and last but not least Theo's own chief scientist Andy McShea was interviewed by Crosscut about The Science of Chocolate. Enjoy! 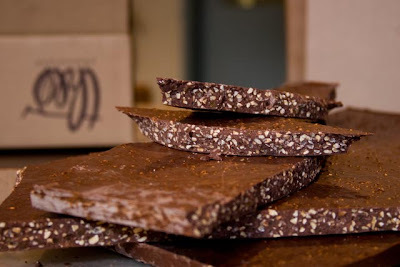 The folks over at chocablog recently blogged about their experience tasting, our 3400 Phinney bread & chocolate bar, and now they have a very nice post about our hazelnut crunch bar. Thanks for all the love! Fremont Universe wrote a little post about how some local Fremont businesses & Theo Chocolate were featured in the recent issue of Domino Magazine. chocablog wrote a great post about our 3400 Phinney bread & chocolate bar (which happens to be one of my personal favorites!). If you haven't tried it yet, I HIGHLY recommend you do so immediately. The American Feast blog wrote a post about Seven Healthy Comfort Foods for Anxious Times Theo Chocolate is on the list. Feelng anxious? Stock up on some of your favorite Theo bars! We made it onto the ecosalon blog post about green gift ideas, we are proud to be amongst the many wonderful gift suggestions they compiled. 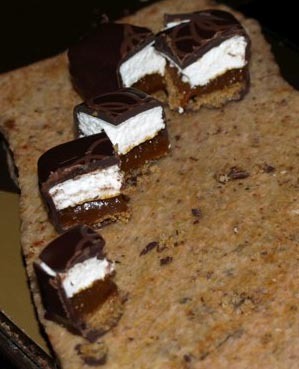 ChefMom has a post about healthier kid-friendly snacks, and Theo Chocolate made the list! Thanks MOM!! Traca Savadogo from the Seattle Food Examiner wrote a piece about attending one of our Chocolate University classes, and our new collaboration with Jane Goodall. Flavor Gusto has written a wonderful blog post about the history of chocolate, with a shout out to Theo Chocolate. Thank you, Kathryn!! LOOK! 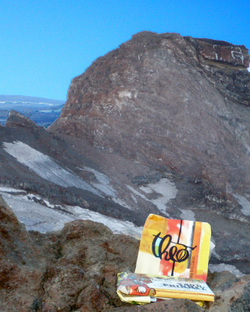 Theo Chocolate up on Mount Rainier! Thanks to Jason for sending us a link to his photos from his tribute climb up the mountain, and sharing the Theo Chocolate LOVE. Sign me up for this! Can't imagine a better afternoon. Thanks to Kittenchops for the heads up. I'm newsworthy! Follow this link to my 15 minutes of fame: an interview with Jack Olmsted aka Videoblogging 206. Recently Gary and Barbara of www.gpsworldtraveler.com joined me for a private tour of the chocolate factory. We wandered far and wide throughout the building, nibbling as we went, and me answering lots of questions (and pointing out my favorite treats!) You can read the article here. Check out the big love! Thanks so much Morgan! Laura Bee Designs - "Where the Money Goes"
I just wanted to shout out to this sweet little article from Laura Bee's blog. Not only does she mention our lovely hand crafted chocolate, she offers a great perspective on smart shopping for these uncertain modern times. Yay Laura Bee!If you aren't familiar with these beautiful made-to-order bags I invite you to check out their web store. I gave Sandi Heinrich a little tour of our factory awhile back and she has blogged it with some of her lovely pictures! She is a professional photographer based in Bellingham, WA, and she does some really nice work. Her blog is here and her portfolio is here. Check out the goods! Wow! Check out the love here. Many nice reviews in there for your chocolate perusing needs. "My goal is to save you wasting your funds on chocolates you would have been happy to miss. Of course, my taste may not be yours, but by comparing my likes and dislikes to yours you may find enough overlap so you can trust my opinion." Sounds like a great idea to me! I love new voices and product reviews, and I especially appreciate the breadth of chocolates reviewed - no elitism here! I shall fear no See's candies. Check out this groovy press hit on Hallmark's Foodstuff with Kate Slate blog. Look! There we are in a delicious Valentine's Day Slideshow on Kaboose. So nice to see our delicious dainties in such good company! Theo has been spotted on another great green inspired Valentine post, this time courtesy of Wecanlivegreen. A Lovely writeup from Stephanie Dickison of Got The Knack. She writes: "With so much chocolate available, don’t you want the good stuff?" And I would have to agree. Check it out! Big love for Aphrodisiac from Cakespy! Menu for Hope IV - End World Hunger, Eat More Chocolate! Cook & Eat » Blog Archive » Menu for Hope IV. This is a gorgeous photo! Love it! Of course I also love sharing delicious chocolate with wonderful people who want to donate to a worthy cause like the UN World Food Program, so rush on over to and buy some raffle tickets~ your money will change someone's life, and the prizes ain't bad neither. Here is a full listing of raffle prizes, how to enter, where to enter, and all the facts. Good luck and good giving! Theo Chocolate is happy to have inspired a moment of satori for gentle scribe Julia of A Year With the Saints. You can read about it here. Thanks to Josh for the mention in his Take 5 post. If surfing be the food of relaxation, click on. Cool Hunted at the Chocolate Show! 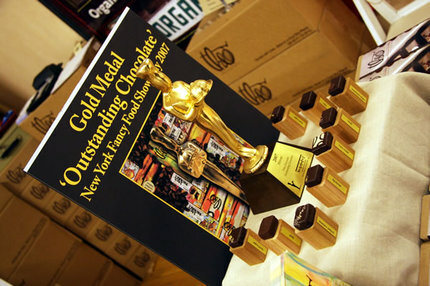 The Cool Kids over at Coolhunting.com gave us a nice little writeup in their New York Chocolate Show post. I always thought we were pretty cool. Now I have proof. A big thank you to Deborah Markus, Chocolate Editor of Bellaonline, for her tasty review of Theo Chocolate. Our crack team of chocolate-ologists are gearing up to head to New York City for the yearly Chocolate Show. Please come visit this weekend! We are at Booth #49. Emily Stone blogs about it here in Serious Eats. 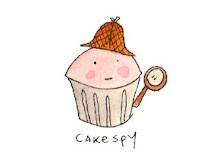 Thanks to Jessie of Cakespy for her lovely little writeup on the Seattle P-I Readerblog site. Not only is she a dessert aficionado and 'cake gumshoe' - her illustration work is just smashing! Check out her Flickr page too. Celebrity Cafe has recommended Theo Chocolate on their Gift Guide for Gals, just in time for the holidays. 3 Ways to Have the Chic Nature-Themed Wedding of your Dreams! Thanks to Tiffany at Talen Events for this mention on their blog. We just love the concept of the Eco-Chic wedding! We got a great hit on e.marie arts, in a sassy post titiled "Things that are making me happy." In return, her Believe Blocks on etsy.com make us happy too! Chassom presents a lovely guide to Tea and Chocolate pairing(pdf format) in the September Newsletter. Diane's site is full of lovely images and inspiring words. Oh and tea.